Classically Liberal: I don't think people ought to send their sons here. I don't think people ought to send their sons here. 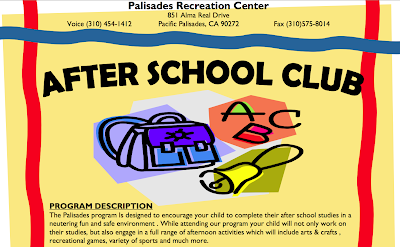 The Palisades Recreation Center has put out a flyer promoting an "After School Club" they are sponsoring for children. I am not sure that parents would want to send their sons to this club, which promises "to encourage your child to complete their after school studies in a neutering fun and safe environment." Sorry, but a neutering environment just doesn't sound very fun to me. And while a lot of woman might not wish to send their sons to such an "environment" quite a few wouldn't mind sending their husbands. Right, Hillary? To enlarge the flyer click on it. posted by blog owner at 11/09/2009 09:26:00 AM DiggIt! Reddit Del.icio.us Slashdot It!